2 bedroom, 2 bathroom barn. 4* gold Rated. Gardens and games room. Kingfisher was so named after a kingfisher was spotted eyeing it's prey in the adjacent pond during construction. This dog friendly barn offers outstanding views over un-spoilt countryside, with French doors opening onto private gardens. Underfloor heating makes for a great getaway for weekly or shorter breaks through the winter and summer months. Kitchens are very well stocked, including a Nespresso coffee machine and coffee. Additionally we offer a generous welcome pack. Main Bedroom has a luxury super king size bed (separate beds can be provided), with Egyptian cotton bedding and hypo-allergenic microfibre duvet with adjoining large en-suite shower room. Kingfisher has a private garden with views over the pond and fields beyond with Rattan table and chairs are for outside dining. Situated in quiet rural location ideal for walkers and cyclists, only a mile stroll from a dog friendly CAMRA award winning Rumburgh buck and an easy drive from the quaint seaside town of Southwold, Heritage coastline and Aldeburgh. 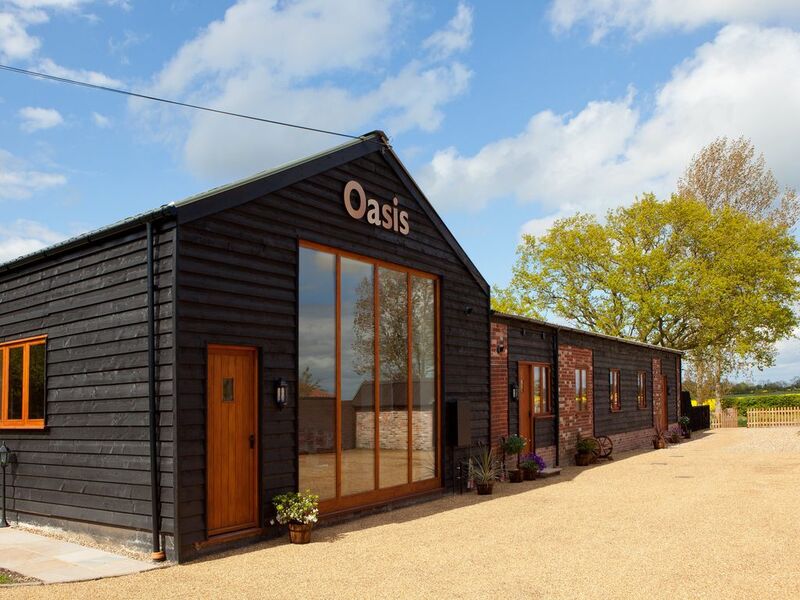 Please also see reviews for Oasis barn. 15% Late booking discount available. Monday-Friday (off peak) - 4 nights for the price of 3. Friday/Monday change over during peak season but flexible off-peak. After 18 months of work the barn opened in August 2015 for it's first customers. The barns have been finished to a high standard to allow you to relax in comfort. 15% late booking discount available. Please check out our 5* reviews. All Saints is a rural spot in the Waveney valley where you can walk for miles across glorious rural farmland in splendid isolation. We are only 1 mile from a CAMRA award winning pub and an easy drive to the coast at Southwold in one direction or the city of Norwich in the other. The local villages and towns are quintessentially English in an area where time seems to stand still. The local brewery (St Peters) is 2 miles away and the nearest Vineyard (Valley Farm) only 3 miles.